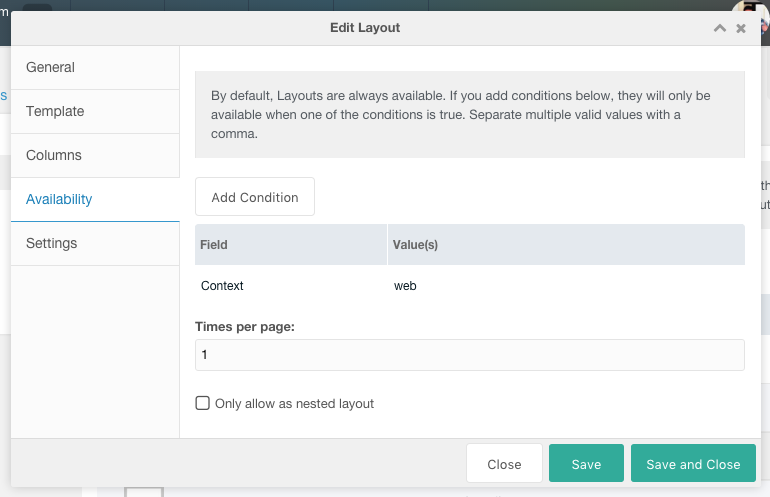 ContentBlocks brings the next level of Content Editing to MODX, providing multiple columns of content, rich input types for any type of content, and complete control over your markup. The Modular Content principle means that you break up your content into smaller pieces of content, that can be used or parsed separately. 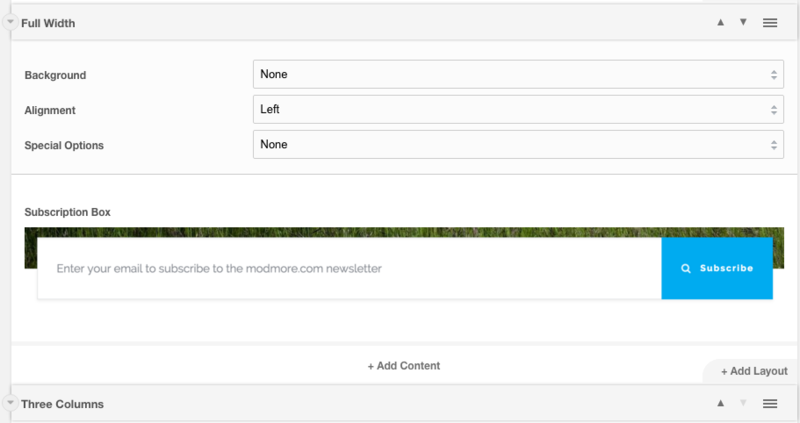 So instead of a single blob of content, you may set a headline, an image and a text description. Each of those small blocks of content have their own template so you can do amazing things with their values. 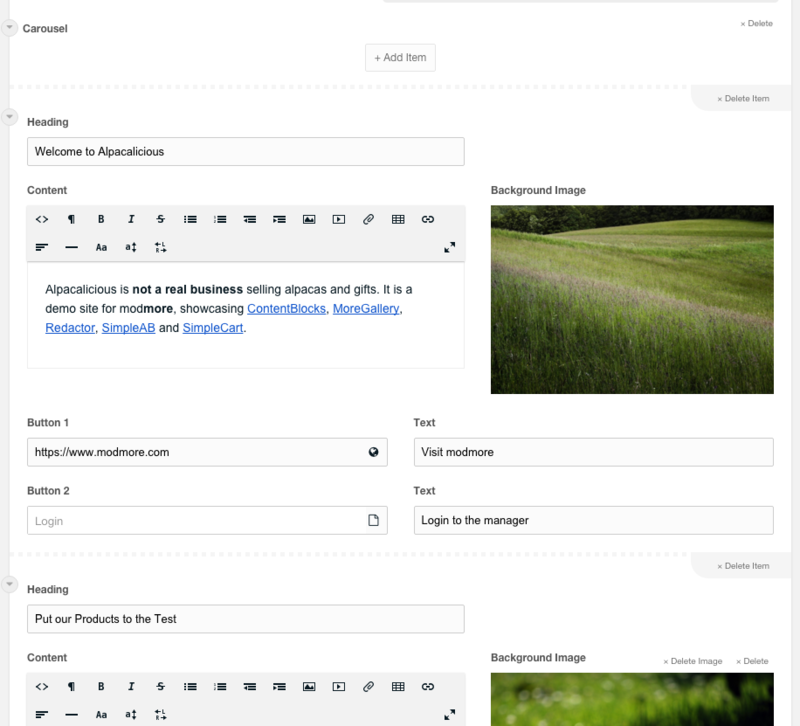 Maybe you want to automatically resize an image or add a filter, or add a clickable anchor to each heading. The sky is the limit! 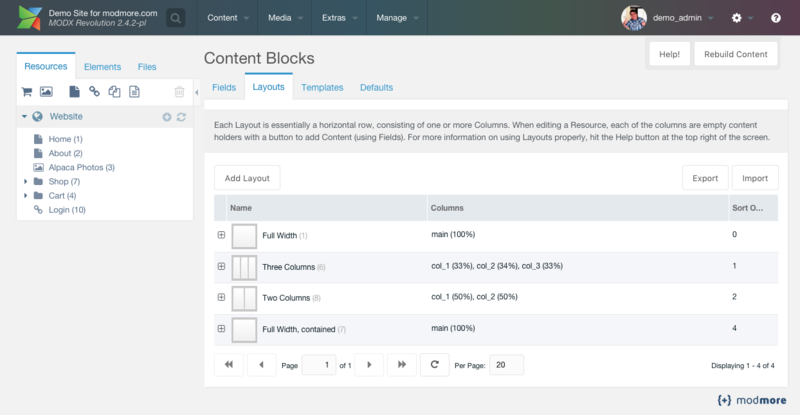 If you'd like, ContentBlocks lets you define layouts that are made up from multiple columns. Each column can contain blocks of content, and you decide how it gets rendered into HTML. This works great with CSS grids like Foundation, Bootstrap or Skeleton, but you're free to use it with your own CSS as well. 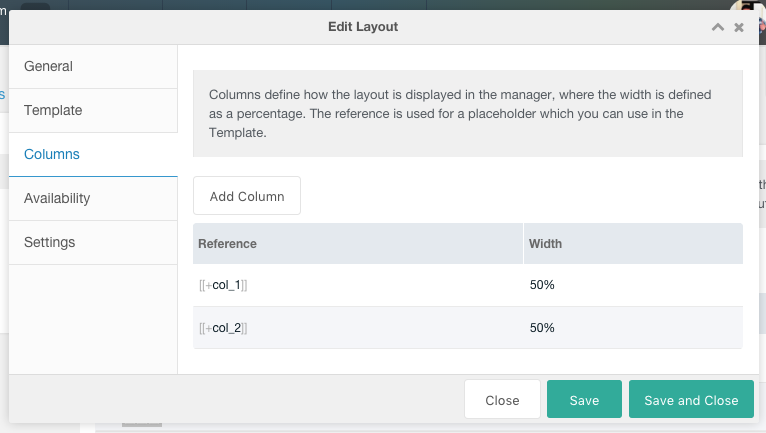 With powerful drag & drop sorting, you can easily move any field from one column to another, or even to a completely different layout. Most editors aren't as tech-savvy as the people designing the site. This can add complexity to content editing where the editor needs to memorise specific steps in the rich text editor to get a certain result. By templateing small blocks of content, even complex markup requirements are easily implemented. Our clients tell us it's hard to go back to how sites were built before after working with ContentBlocks. Powerful templating, easy to configure and customise, and XML import & export features to enable reusing your favourite blocks on new projects make it a developers dream. And of course our support team has your back when you need a nudge in the right direction. 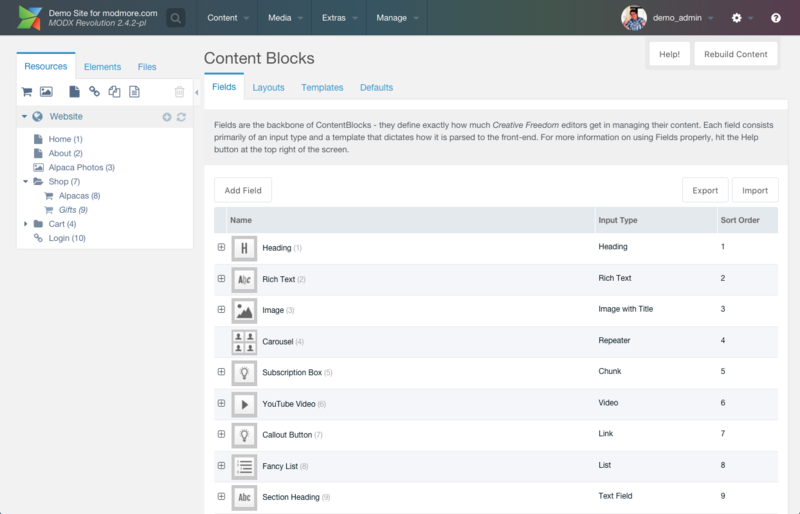 Using ContentBlocks has changed the way I approach site building and made it much easier to train non-technical end-users on how to maintain their site—all while giving them more creative freedom over how content is displayed. It's a shame this isn't part of core Modx, but the unlimited license is worth it in for the amount of time that can be saved throughout site building and training. The 1.0 release was great, I can't wait to see what's coming down the road from Mark and the modmore team! And while the product itself is top-notch, their quick and attentive customer service and support adds even more value to the purchase. Looking back on the history of MODX we'll have Evo then Revo before Content Blocks and Revo after Content Blocks. Every project we do will use it. A deal at twice the price. 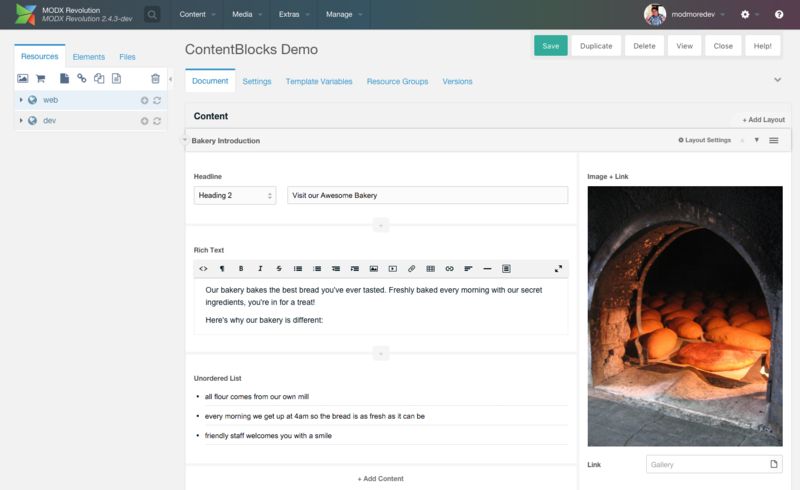 ContentBlocks offers the user handy building blocks to create complex content areas with just some clicks. 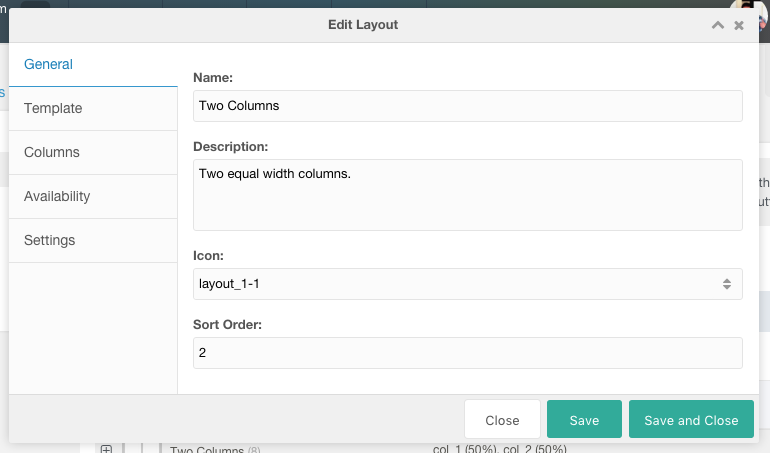 It's easy to setup or configure by the designer and even easier to use by the client/editor. It works perfectly and intuitively with modern - responsive - grid systems and makes sure that you end up with clean HTML-code. 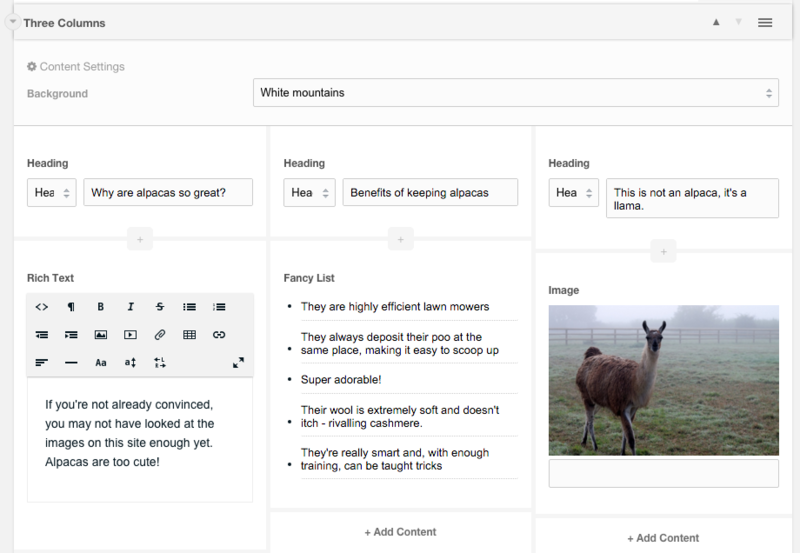 ContentBlocks turns the content field into a powerful canvas. With a complete set of flexible content types you can build immersive landing pages and complex designs, without the editor touching any code. 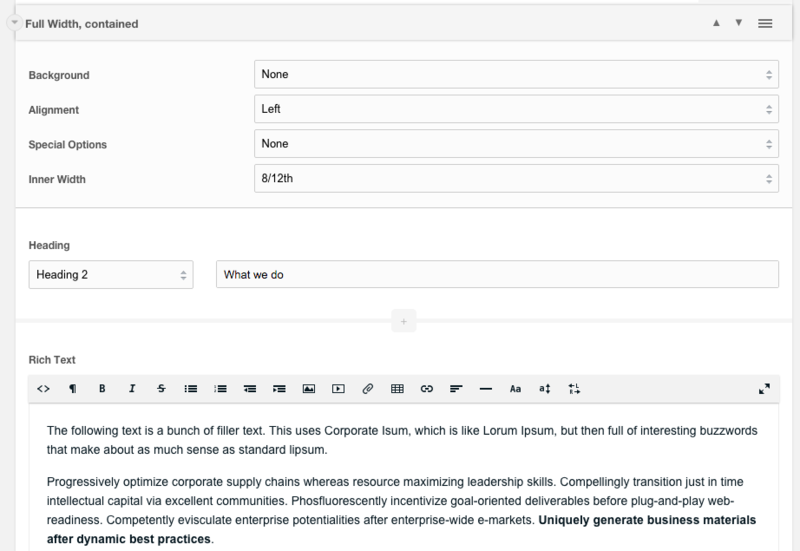 For the simple - yet perhaps most important - types of content, we've got a suite of text-based inputs for you. Varying from a single line of text, all the way to a rich text block. 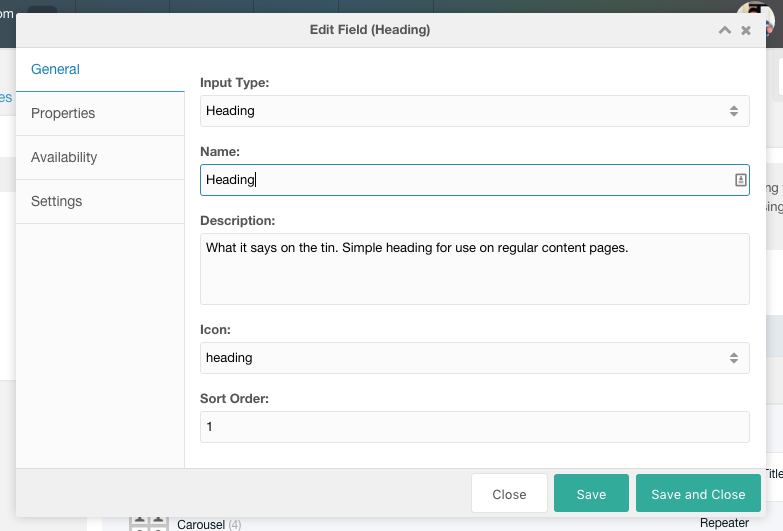 And for special, common types of text like headings and quotes, we pre-built some inputs for you too. For all your images, from a single image through a full-featured inline gallery and file attachments, our media input types make it easy to upload or browse previously uploaded media. 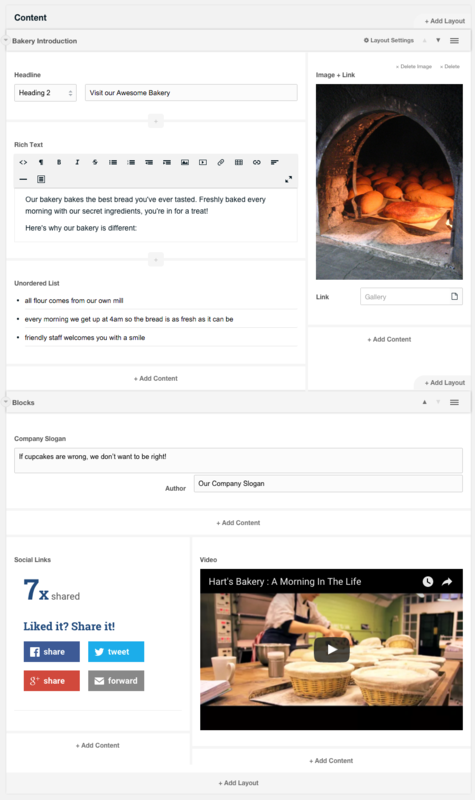 With the separately distributed oEmbed input type, you can embed various types of content from dozens of different sources, just by pasting in the link. 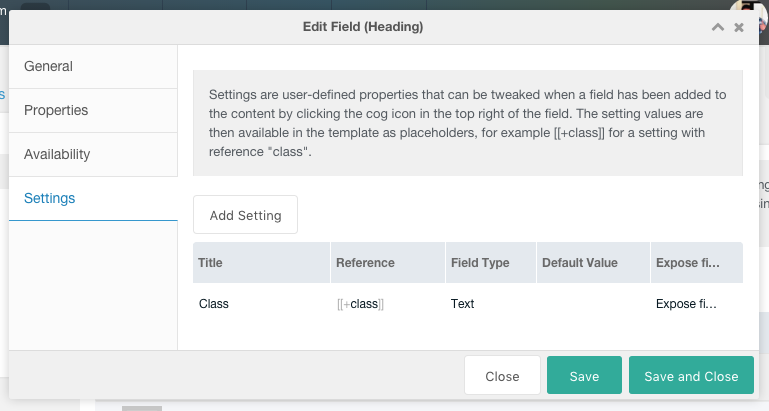 With the Link input type - also available as field and layout setting - you can link to local resources, public urls or email addresses all from the same field. By simply typing in the title of a resource, a dropdown will appear with the option, and it will add the full link tag automatically. Perfect for read more buttons and other call to actions. In this example, a local resource (Gallery) was selected, so it shows the page title to the user, while the actual link uses the ID. Very much optimised for keyboard usage, the list and ordered list input types allow you to easily generate lists. They support multiple levels for your really complex lists, and have an embedded (optional) tiny rich text editor to add bold, italic and underline formatting, as well as links. 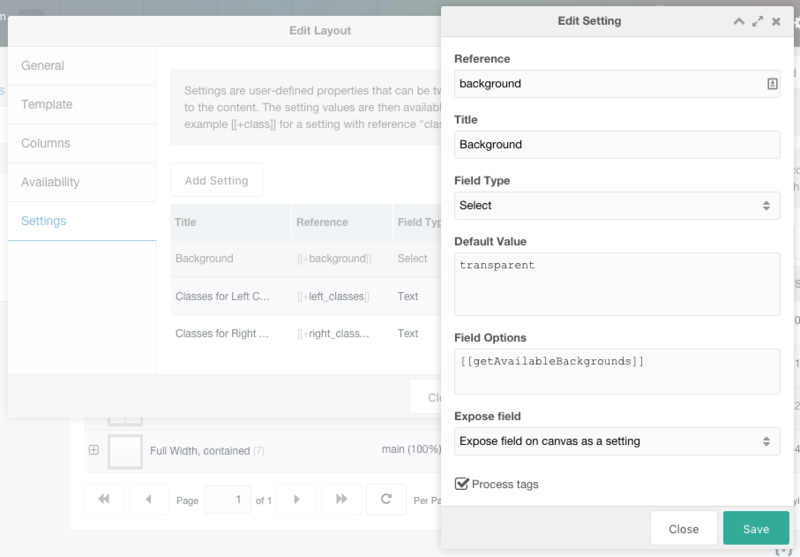 With the Snippet, Chunk Selector and Chunk input types, your editor will be able of adding those elements into the page, optionally with element-specific properties, without needing to understand the MODX tag syntax. To them, they just choose a type of content. In this example, the Chunk is fixed and the preview uses a screenshot of what it might look like to the visitor. With the Video input type, the user can paste in a link to YouTube and see the proper embed appear instantly. But there's also a search - simply enter the search term, and they're provided with a list of matching videos. Great for cats and dogs! 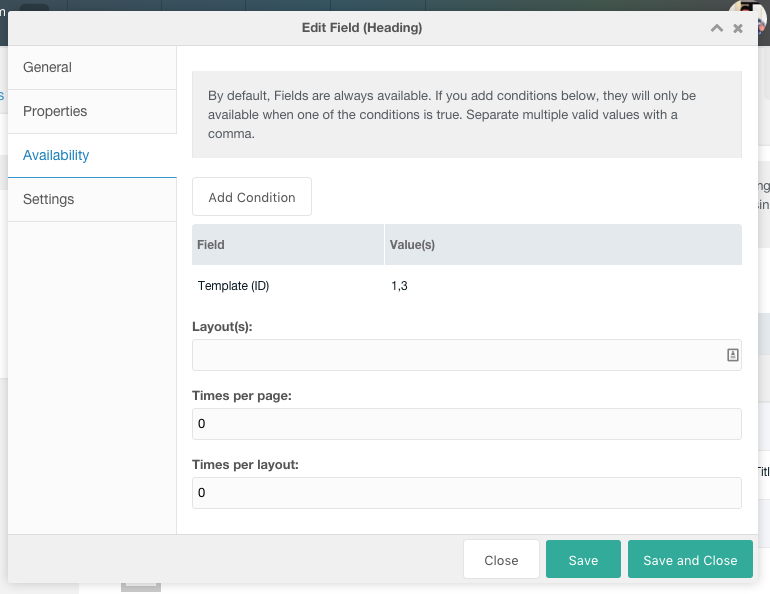 With the Field and Layout settings in ContentBlocks, you can add advanced features for advanced editors. These can be shown directly on the canvas to ensure the user fills it, or made available from the Settings button here. 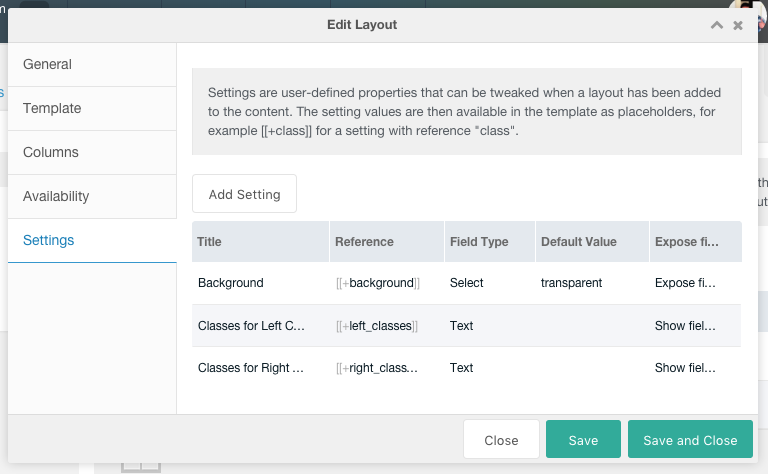 Common use cases taking advantage of settings involve setting classes or backgrounds. Need to add another layout somewhere in the middle? The Add Layout button (new in 1.3) gives you that ability. There's also a big button bar at the bottom. 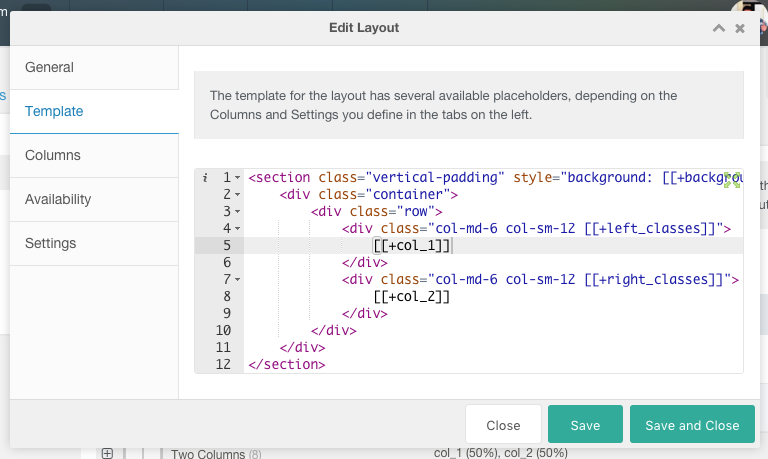 When adding layouts, you might give them a descriptive name like "main and sidebar", or "full width". But once added to the canvas, that doesn't quite cut it anymore - so you can change them to something that describes the content accurately by just clicking on the name. 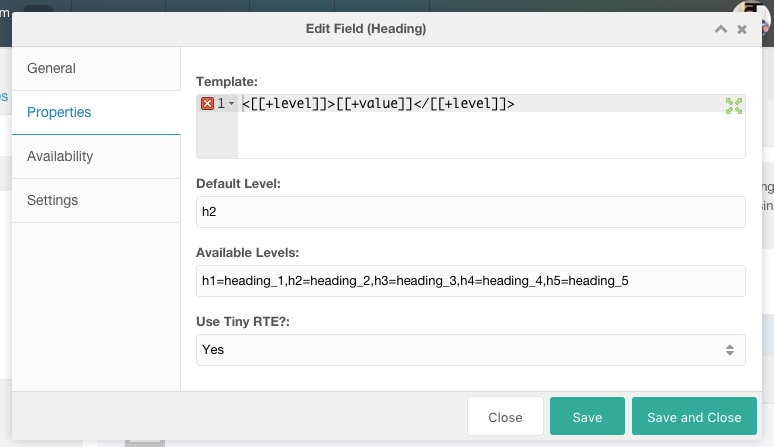 We recommend using Redactor with ContentBlocks, however other Rich Text Editors like TinyMCE (the classic and "RTE" release) and CKEditor are also supported. Take a look at what ContentBlocks has to offer. Or try it out live on our Demo Site! 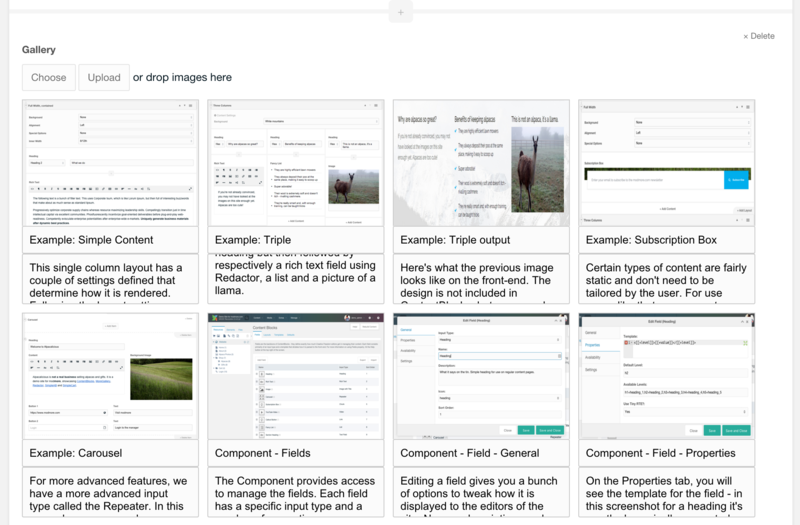 The screenshots below give you a quick at-a-glance overview of what ContentBlocks can do, but you're also invited to login to our demo site and play with our example setup.